The Moon Jellyfish offers several subspecies. It is really impossible though to tell them apart without taking samples of their DNA. They look too much alike in terms of their physical appearance, however, they have no sexual reproduction organs that determine this. Again, it is determined by their DNA profiling. Before DNA profiling was established though all of the subspecies of the Moon Jellyfish were lumped into one category. There are still those that argue they should be but the experts maintain that due to the DNA differences they shouldn’t be considered only one species. This is why you will find conflicting names for them as well as population numbers. It all comes down to the classifications that are being used. 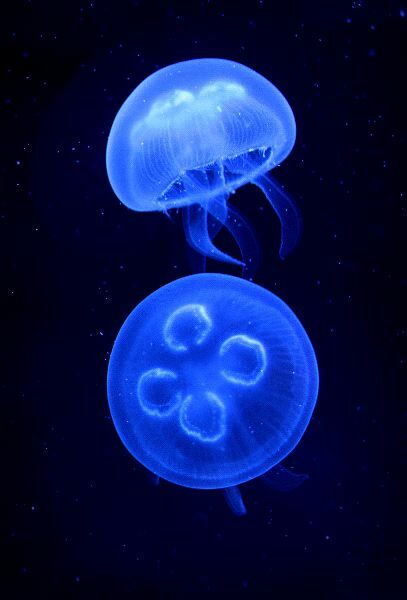 There are four horseshoe shaped gonads that are found at the top of the bell for the Moon Jellyfish. Their body is white in color and round which gives it the moon shape. That is where their name derives from. They are very transparent too so when the sun or the moon is shining on them they look just like the moon does all lit up. They have very short tentacles in terms of what other species of Jellyfish offer. When fully grown a Moon Jellyfish is typically from 25 to 40 centimeters wide. Due to the round look of them they are often referred to as the Saucer Jelly. They may have stripes or spots when they are younger around the middle of the bell area. They have a centralized censoring system in their body that allows them to find prey. They don’t have a brain and only about 5% of their body is made up of anything solid. It isn’t fully understood how long the Moon Jellyfish has been on Earth. There is evidence though to suggest that some species have been for million years. Where the branches have occurred to create the more than 1,500 species though are still unknown. Many experts believe that the overall functionality of the Moon Jellyfish has been able to adapt over time to changes in temperature and allocation. They have also been able to develop the toxins in their bodies to be able to protect them from predators as well as to get their prey. The Moon Jellyfish has a very limited ability to move where it would like to. The current of the water and the wind is what takes it from one location to the next. They don’t use their body energy often to be able to try to swim around. This is why they tend to like water that has currents that are constant. They spend most of their life just drifting around in the ocean waters. A sting from a Moon Jellyfish may hurt but it won’t be fatal. Typically there is pain and a small rash that is red and swollen will result. However, many people don’t even know that they have been stung by one due to the fact that they don’t penetrate well through skin. People that have thicker skin aren’t going to feel the Moon Jellyfish like a child or someone with thinner skin would. This particular type of Jellyfish tends to stay close to the surface of the water. Those that know what they are looking for can avoid them. However, many people in the water don’t even realize what they see. This certainly isn’t the physical appearance of what must of us have in mind when we think about a Jellyfish. This particular Jellyfish tends to live alone. However, there have been times when they are known to be in groups known as blooms. This is due to them being at the mercy of the current and the wind though. That is why they are often found in large numbers on the shore. You will find this particular species of Jellyfish living everywhere in the oceans. They live in the warm waters as well as those that are cooler. Europe and North America are the most common locations for them. Canada and New England contain high populations. Experts do believe that their numbers have been on the rise for the past couple of decades. This could be due to the drop in various types of predators in those given locations. One of the factors that has been believed to kill large numbers of the Moon Jellyfish though is pollution. They have a thin body so various type of toxic materials can cause diseases and other health problems that they can’t overcome. Mollusks and plankton are what the Moon Jellyfish consumes. They will also consume eggs and various types of mollusks. They have hearty appetites and will consume food as often as they can. They have a very large stomach that allows them to swallow food whole and then for it to be broken down. They need protein, carbs, and lipids to survive. The tentacles of the Moon Jellyfish allow it to capture prey. The tentacles have powerful toxins that immobilize the prey long enough for them to swallow it. They rely on digestive enzymes in the stomach lining to break down their prey. The Moon Jellyfish tends to do very well living in captivity under the right conditions. They will consume brine shrimp in such an environment and survival well on it. In the summer time the Moon Jellyfish will take part in offering eggs and sperm on a daily basis. This is a process that will leave them weak and hungry. At the end of that process they will likely die. They tend to only live about 6 months in the wild from the time they are a full Jellyfish. This reproduction process can make them vulnerable to various forms of bacteria too that can end their life sooner. 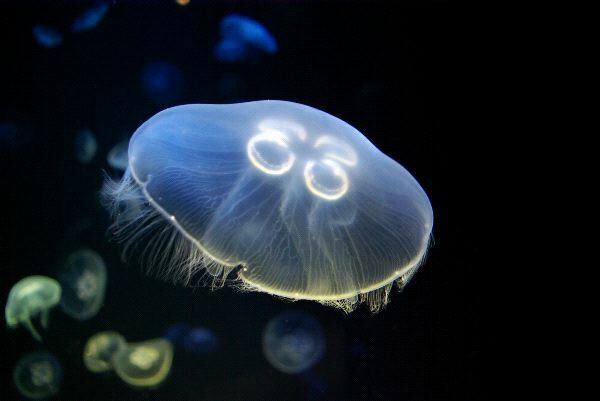 There are several known predators of the Moon Jellyfish. They include Sea Turtles that rely on them for food during their daily lives. However, they also rely heavily on the Moon Jellyfish to supply them with food during their annual long migrational journey. Other predators including birds that will feed upon them when they get close to the shoreline. Humans are also predators of the Moon Jellyfish. They often assume that they are just as dangerous as any other type of Jellyfish. They don’t like the idea of being in the water with them. In some heavily populated tourist locations efforts have been made to limit populations. These locations are worried that they could lose out on the business of tourists of there are too many Moon Jellyfish around.